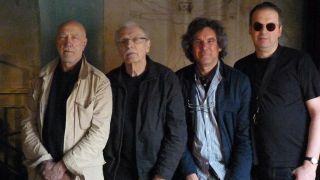 Soft Machine Legacy have announced a show at Ronnie Scott’s Jazz Club in London. The one-off appearance on August 9 sees original Soft Machine members John Etheridge, Roy Babbington and John Marshall team up with saxophonist and flautist Theo Travis and pianist Keith Tippet. The evening will feature “prog-rock, jazz-fusion, rocking blues and every point in between” and tickets are available now direct from Ronnie Scott’s website. The group’s last release was 2013’s Burden Of Proof.